This blog post is part of the "Tech Talk" series focused on the FirstNet Authority’s standards development activities to support the public safety community needs. 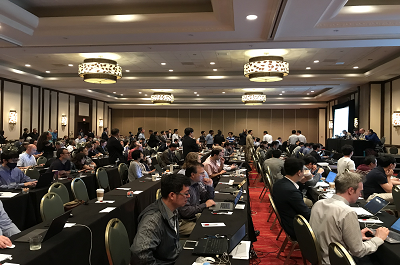 This post recaps discussions linked to public safety and other related topics from the 3GPP Plenary meetings that were conducted from June 11-15, 2018 in La Jolla, CA. The First Responder Network Authority (“FirstNet Authority”) represented public safety interests at the plenary meetings. In the FirstNet Authority’s ongoing effort to keep you informed regarding standards development activities impacting public safety, and following our recent update on the March Plenary meetings in Chennai, India, this blog discusses the latest developments from the 3GPP Plenary meetings held in La Jolla, CA, from June 11-15, 2018. The June quarterly meetings addressed standards in several areas relevant to the Nationwide Public Safety Broadband Network (NPSBN) in three separate plenary group meetings. More than 400 registrants representing vendors, operators and government agencies from around the globe participated in the RAN Plenary meeting. The biggest announcement came from the RAN group when it froze the specifications for Release 15 5G New Radio (NR) Standalone (SA). The SA specification supports architecture options 2 and 5 that facilitate single mode NR and single mode LTE mobiles working individually with Next Generation (NG) 5G core network respectively. As you may recall from our last blog, we noted that the specifications for Non-Standalone 5G New Radio (NR) (5G NR mobiles working with legacy 4G core networks) were completed in December 2017. Enhanced LTE support for aerial vehicles such as those used for surveillance. Narrow-Band Internet of Things (NB-IoT) which could potentially serve many public safety applications. The CT Plenary meeting included about 160 global registrants. The big news is that Release 15 Stage 3 (protocol development) of 5G Phase 1 was declared complete. Even though Release 15 is now considered complete, extensions for specific enhancements were granted through the end of September including some items for mission critical features. While the work to finish specific mission critical features is still significant, steps are being taken in 3GPP to remedy this, including scheduling a significant amount of time at meetings during the next 3 months. The FirstNet Authority is taking steps to organize this accelerated effort on behalf of the companies that contributed to this effort and that will take advantage of this new meeting time. Our goal is to complete these enhancements by September. First responders will be interested in the innovative and useful capabilities contained in this Release 15 work. One major capability will be an enhancement to use the location of a first responder to ensure that the person is notified when they enter an emergency alert area. This same capability will allow automatic affiliation/de-affiliation from a group based on crossing a geographic boundary. Another appealing capability for many jurisdictions is automated and dynamic updating of a first responder’s profile triggered by criteria such as time of day, location, and incident activity. In the area of multimedia broadcast, a number of improvements are being undertaken to enhance the delivery of Mission Critical Voice, Data, and Video to first responders via broadcast features. Those improvements include delivery of emergency alerts, group configurations, and short data. Relative to Direct Mode communications (device-to-device), enhancements are planned that cover distribution of emergency alerts and data files, both when off-network and when connected to the network via a relay device. Finally, there are enhancements planned regarding the ability to push video to other devices, and for devices to share their capabilities to take full advantage of what LTE can offer. The public safety community will also be interested in a new work item on interworking with legacy Land Mobile Radio (LMR) that was approved at the Plenary meeting for Release 16. While Release 16 work is not expected to be frozen until the end of 2019, completion of this interworking effort is targeted for December 2018. With nearly 240 global registrants, the SA Plenary meeting focused on continued progress for Release 16 work items. Since it is early in the Release 16 schedule, there was much discussion this week on prioritization and coordination with other Technical Specification Groups (TSGs), particularly RAN, to ensure that all aspects of system level features are included in each TSG's release planning. SA2 (architecture) is the most overloaded working group within SA, so considerable time was spent prioritizing their work items and aligning them with RAN Release 16 projects. SA2 touches mission critical work at the intersection of network architecture and enablers such as end-to-end QoS, Priority, and Preemption (QPP), the IP multimedia subsystem (IMS) Core, Location Services (LCS), and the Group Communication System Enabler (GCSE). SA2 has progressed the work for the “Enhancement to Service Based Architecture for Location Services” and “Enhanced IMS to 5GC (5G Core Network) Integration” Release 16 studies since our last blog. As we mentioned in our previous blog, Location Services and IMS are key for mission critical services. SA2 has approved a number of new Release 16 studies that help enhance services for the public safety community. For example, one of the objectives of a new work item for enhanced real-time communication is to improve the call setup time for group communication by enhancing IMS message flows. In SA6, the Mission Critical Applications working group, several new work items related to public safety were proposed and approved. These included new features such as Discrete Listening, plus enhancements to Interworking, MCPTT, and MCData. The list of new work also includes a study to determine changes to existing specifications to support mission critical services over 5G. Finally, in SA1, the Stage 1 Requirements working group, the technical reports for studies on high accuracy positioning and satellite communication were completed and approved with obvious potential impacts and applications for public safety. In addition, new work items related to mission critical features or compatible verticals such as Maritime Communications, and the normative work phases of Satellite Communications, and high accuracy positioning were approved.